The category Cross-stitch in online store Kadifecraft.com includes some of the most beautiful and unique cross-stitch and embroidery collections in the world– Riolis, Lanarte, Heritage, Duftin, Ravel, Orchidea, Vervaco and Nimue. The products are over 3000 in a great variety of embroideries and the number is constantly growing which makes choosing a kit more pleasurable and gives ever better options. Each product in our website is shown with a photo and a description. We constantly add additional information to each product to increase the knowledge about the products, the brand and all interesting details about each kit as we hope this will give you more pleasure when you pick up your favorite ones. If you have questions about the products or the shopping itself and you do not find your answer here you can check up our Frequently Asked Questions. page or you can write to us and we will promptly answer. On the drawing you can see how to create a cross-stitch. Each cross-stitch kit has a drawing and instructions how to create a cross-stitch. The threads in the kits are usually estimated and tested for a specific type of stitch and it is rather a good idea to follow the instructions in the kit for otherwise you might run out of threads. Most commonly cross-stitch kits are 1:1. That means that one square form the drawing signifies one square on the fabric. When the fabric is 27 ct one square from the drawing signifies four squares on the fabric. If you read your instructions they will include such informations. Some manufacturers give you the option to choose between 14 ct and 27 ct. Each product that has such an option has a drop down menue which you can choose from. When you cross-stitch the seccond diagonal must always be in the same direction. This gives the image a better and more beautiful estetic looks. Back stitch is usually used to create jentle borders and draw fine details in the images. Each kit has an instruction where and how to place the backstitshces to achieve the final embroidery. You will see this stitch on many places, on some places it can be substituted with long stitch on other wit Holbein stitch but if you follow the instructions in the kit it will be very easy. An example of such stitch you can see in the product "It's a Boy!" designed by Riolis. The satin stitch gives a smooth and even looks on the embroidery. It is made as shown on the image. It is use ofthen to fill preprinted arias on the fabric and it really looks amazing. An example of this type of stitch you can see here on one of Duftin's beautiful table-cloths "Blue flowers and butterflies". Border stitch is used to create a little bit thicker outlines and shapes and as for how wide it is and how long are the separate stitches usually is shown on a preprinted fabric. It is perfect for drawing braches and looks beautiful. An example of this stitch you can see on the tabletopper of Duftin "Flowers". Short and long stitch are usually used to create a beautiful surface as the both stitches step near ecach other and fill the usually preprinted fabric in a smooth way. Most often colors are mixed and this time of stitch combination give really amazing color stransformations. You can see an example of this stitch here on Duftin's tabletopper "Beautiful Roses". The french knot is a beautiful and usefull stitch which is used mostly for accents and details in the embroydery. We have seen thought amazing embroideries made almost entirely with french knots. To create a french know you can follow the instruction on the drawing. 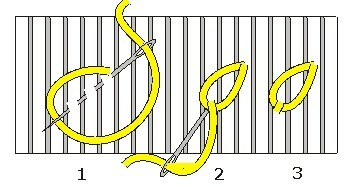 The strait stitch can be long or short. It is made as shown on the image and can be very usefull in free embroidery techniques.It is usually preprinted on the fabric so this will give you an idea exactly how long it must be. The :aisy Daisy stitch is very useful in some free embroideries and looks very pretty on the fabric. It is easy to create and you can follow the instruction on this drawing or the instruction in each kit that implements Laisy Daisy. This stitch is used for extremely fine and delicate embroideries. It is created by sewing first in one direction and then sewing back as shown on the image.This stitch gives a very straight and fine line and is perfect for drawing. It is called Holbein stitch after the painter Holbein who painted portraits of Henry the 8th and other members of the royal family with clothes decorated with blackwork stitsch. This stitch is famous also under other names - linear stitch, spanish stitch, double running stitch, double linear stitch and kiara stitch. Cross-stitch is maybe the oldest known stitch type widespread in folk art all around the world. Numerous museums in Europe and Asia have exibitions with old clothing decorated with cross-stitch. The floral and geometrical designs in cross-stitch are also traditional for the folk art in eastern and central Europe.Usually these designs are found on table-cloths, curtains, cushions and other fabric personal belongings. Most often the fabric is red, green or black. As a way to work on fabric cross-stitch is found in two main ways - counted cross-stitch and printed fabric cross-stitch. In counted cross-stitch each stitch is counted on the fabric acording to the drawing and in corespondence to other stitches which forms an image. When the drawing is printed on the fabric you stitch over the printed areas and the actual cross-stitch might be positioned on the fabric without any corespondence to the type of fabric and its squares. We call printed fabric cross-stitch as well when we have a color prestamped Aida fabric and the drawing and instruction where each color goes is in the print itself. You can see an exmple on printed fabric here in Orchidea stamped aida - collection 18 / 24 cm stamped cross-stitch fabric. 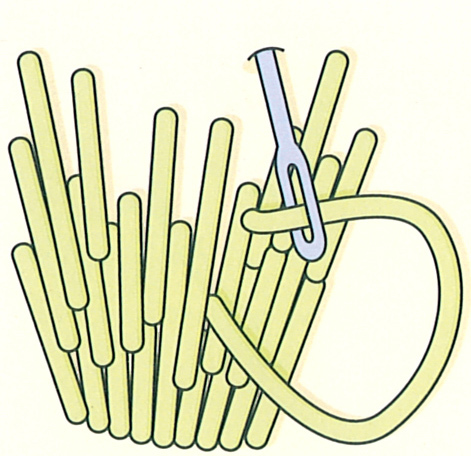 Stitch techniques are defined either by the type of stitch used ot by the stile in which it is used. As we said before in cross-stitch we follow a drawing and each square from the drawing corresponds to a square on the fabric. We stitch even stitches that form the final image. In printed cross-stitch we stitch on a preprinted fabric and this print is our main drawing and instruction where the stitches go. It is not necessary for the stitching to follow the actual fabric suares as the print can be situated freely on it. The free embroidery is stitched over a printed fabric it is not counted and it can contain all kinds of stitches. It can use a mixture of threads more than any other type or stile of embroidery. It is important when you stitch to have your fabric well and evenly stretched so that the thread will position well and will not shrink the fabric or be too loose on it. Asisi technique is called that way after the city Asisi in Italy where it was especialy spread and famous. Asisi is a type of stile where the background is filled with cross-stitch and the drawing itself is left blank. Most ofthen the drawing has a contour made with backstitch, or blackstitch called also Holbein stitch. Bargello is a type of technique which is made traditionally with vertical long stitch arranged in mathematical models to achieve a pretty image. Other names for this stile are florentian stile, Hungarian stile and flame stile. After the 60s of 20th century this stile is used again and a bit modified. You can see examples of Bargello in the collection of Vervaco here - collection Bargello cushion, Cushion Bargelo, Vervaco cushion, Design Bargello, Vervaco bargello cushion. This technique combines stitching, cutting and croche. The english embroidery is comming most probably from the teritory of Chech but the huge interest for it in England in 19 sentury and the high level of complicity and quality have dictated a new name for it - english embroidery. Because it is indeed very complicated and slow today english embroidery is made only with machines. These names correspond to the same type of embroidery technique and on different places can be found together or separately. LIke in the collection of Ravel Holbein embroidery collection. The idea is to use blackwork stitch instead of back sttitch because the blackwork/holbein makes the line look more even and look beter in some ways. These embroideries become very prety and are very nice to create. You work with a drawing just like in counted cross-stitch. One of the things that make this technique so pretty is that it resembles graphic drawings. Today most embroideries are made with cotton threads. There are many brends of quality threads but as an exmple such threads are DMC and Anchor. The cotton threads are 6 strand made of marcelized cotton very strond and resistant. The quality threads go smoothly in the fabric and have an even and shiny looks. 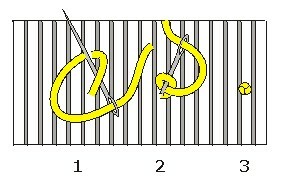 It is easy to separate the six strands. Usualy the cross-stitch is made with two strands, separate colors may be stitched with one strand and the printed fabric is sometimes sticthed with 6 strands. Diferent product lines may have other types of threads like acryl and woolen-acrylic threads. Woolen-acrylic threads are common for the famous collection of Riolis "Create it yourself". Riolis use these threads because they give a more embossed looks and indeed very pretty one. These threads look at first a bit strange but once you start working with them you will see how pretty the designs become. Riolis is established in 1996 in Russia. Scince then Riolis is building it's reputation of one ot the most unique and beautifull cross-stitch kit manufacturer with trully amazing designs. The two main collections "Premium" and "Create it yourself" are indeed verry beautiful. Large part of "Create it yourself" is made with woolen-acrylic threads and this gives the collection part of it's unforgetable looks. Riolis designs are rich in color, perfectly arranged towards number of colors used, come in a great variety of topics and are trully impressive. Permin is founded in 1854 by Christian Permin to provide homes and people with embroideries on clothes, furniture and various other objects. At the beggining of 20th century the firm developed a new strategy and started offering materials for embroideries which led to the creation of their own embroidery collection. Today this collection is ever bigger and ever better for the quality of the used materials is of top level and the embroidery designs are modern and beautiful. The collection is huge and very rich in colour, deigns, themes and artitic value. And at the same time the designs are very carefully created to be entertaining but easy going so you can enjoy the creation of the design and jut let it lead you. If you are looking for thematic embroidery as well you need to check them out because the collection is enormous and you might find just what you are looking for. Nimue is an embroidery and cross-sitch collection that comes from France. The designs and style of this beautifull collection are really very original and it stands with this originality. Some of the models that we love so much are created after the drawings of D'E, D.B Monge and Feroniere. The collection of Nimue is famous for it's unique caracter and style and uses a great variety of materials and embroidery stitches. You will find very often additional materials like beads, special threads and special stitch instructions as the images become so fairytale like thanks to all these materials and way of working them. Alice is a collection of cross-stitch embroideries with a vivid and happy mood that will amaze you with it's colours and beautiful looks. Alice is filled with this happy and lively mood that you get every time you create one of the models. The collection is created with Gamma threads and fabric that are of a very good quality. The designs and topics are mainly beautiful flowers and cute animals, but you will find bigger models as well on other topics like landscapes and art. Lanarte is established in 1934 in Netherlands as a store for sewing materials and special unique buttons and accessories. In the 60s of 20th century the family run firm sees an opportunity in embroidery kits and ever scince Lanarte is famous for it's tender and beautiful cross-stitch kit collection. The Romance collection is aquarelle and very jentle.It is one of the most favorite ones ever. Famous as well are all the designs sfter the drawings of Sara Moon. Each of the collections of Lanarte has it's own charm and it is definitely worth seing and falling in love with. Lanarte cross-stitch collection you can find here. Duftin is founded in Hungary in 1986. The collection is verry pretty and includes table-cloth, cushions, bags and kits for the youngest stitchers. Duftin is famous for using a great number of diferent stitches that are implemented in trully amazing ways and combined to give a beautiful and unforgetable designs. Each drawing is easy to read, most of the kits are with prestamped fabric and all these diferent stitches are really very easy to finish and recreate beautifully. We are constantly looking for beauty in all it's shapes and forms and Duftin give us the opportunity to put real beauty as well on our table while enjoying our loved ones company. Here you can find Duftin table-cloth collection. Heritage is an english collection with unique designs and color approach. The subjects are often joyful, romantic and dreeme as the designers draw the wold in avery intriguing and jentle way. Part of the collection is all about England, english traditions and way of life. A verry beautiful collection is "Elegance" by John Clayton that presents portraits of pretty women all of them interesting with their charm and colors. Here you can see al the Heritage cross-stitch kits and read more in the descriptions of each product. Usually the embroidery kits include the folowing materials:drawing, legend, aditional informations and instructions, fabric, threads, needle, a number that stands for the preson who assembled this kit and any other materials needed like beads, special threads, felt or ribbons. The drawings are usualy 1:1, which means that one square on the drawing represents one square on fabric. A special case are the kits with 27 ct fabric that are 1:1. In this case one square form the fabric represents four squares from the fabric that are cross-stitched togeather. You can find such kits in Lanarte and Heritage collections. Read carefully for aditional instructions on each kit if this is indeed the case. Drawings are usualy black & white but in Riolis and Ravel they are color printed. On the drawing there are always arrows that point to the center of the fabric. These arrows are meant to help you find the center of the drawing fast and easy. This has to do with the process of begining to stitch your embroidery. Fabrics are by rule sized exactly for your kit which means that you have a reserve on all sides but still not unlimited. This is why it is best to start your work from the center of the fabric. The center is best foun by folding the fabric in two and then fold it in the other direction again in two. This is a very simple advice and it might seam to you unnessecery but every now and then it happens for someone to just start stitching and suddenly apear near the end of the fabric. So to position your work well and keep your pleasure from spoiling you can follow this instruction. The fabrics are most often hardened to make it easy for you to work on them so they will not destroy arround the edges. But if you feel like you need to secure your fabric you can do so by placing a side stitch on the edges to secure it. Please do not use threads from the kit because they might turn insufficient at one point. As apropriate all kits include a legend. Such will not be included if there is no need for it - one color for example. On this legend you will find all the colors attatched with a number and or a sign that correspond to the ones on the drawing. So when you read your drawing you will look for the corresponding thread on your legend. Without the legend you can not position your threads correctly. All kits include a needle. Diferent threads and diferent counts of fabric may and will come with diferent needles as well. In some embroideries the needles are as well more sharpened on top others are with wider ear for the thread to pass easy trought it. Some kits like Vervaco latch hook kits do not include a needle but a latch hook. This will include all instructions by the manufacturer and the designers about the embroidery. Here you will find all kinds of usefull information how to make the best of your kit. These instructions can come on the drawing or on separate sheets. They always have a translation in english and many kits have translations in many other languages. How to create the designed stitches, where to start from, how to work with the threads, legend and all aditional materials - it's all there. Have in mind thet all kits in our website are originals which means that you will receive a full kit with everything the manufacturer has packed for you. This is a very important number. By rule everything that is in the kit is importat and you should keep it untill you finish your embroidery. This number is your garantee that if anything in the kit is not as it should be you will get aditional materials by the manufacturer. This number is needed by the manufacturers to keep control over the assembling of the kits and should anything be wrong to sanction the person that made a mistake and assembled this kit. This is why it is really verry rare to find a mistake. Should you have a kit with a problem thought you need to contact us and present a photo of the backside of the kit and the number of the kit assebling employe. We will respond fast and will ask the manufacturer for aditional original materials. Some kits may include beads, ribbons, felt or special threads. All that is needed to finish your embroidery is in the kit. Usualy there are aditional drawings how to use the materials and if the materials are not included this is explaned ahead in the description of the product in our website. Do not make knots on the back side of the needlework. Try to keep the backside clean from loose threads. If you work with a frame after you stop working loosen the frame and let the fabric rest. If you are working over a free embroydery or over a preprinted one always use a frame to make sure your work will come out evenly stitched. If you have started a kit don't give it to someone to finish it because each of us stitch diferently and it is visible when diferent people have worked on it. When the embroidery is finished you can wash it with warm water and let it dry over a towel. When almost dry you can iron it on the back side again using a cotton fabric as a layer. When you want to frame your embroidery make sure you have perfectly ironed it becuase if you don't some folding on the fabric may still be visible after framing. The cushions kit usualy include - drawing, fabric, threads, needle and a legend which is either printed on paper or on the fabric itself. Usually the kits do not include the back of the cushion. It is sold separately. The kits that do include a back give you the possibility to use it if you like it - it is an adition and you can always place your own back.